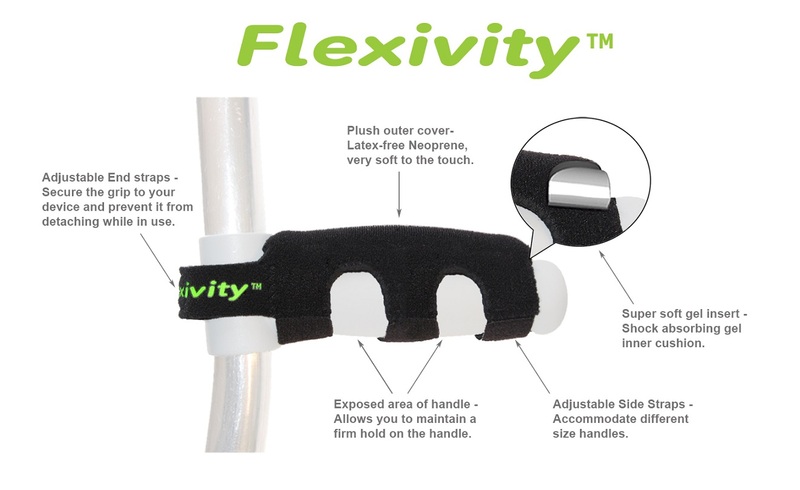 Flexivity® is a leading provider of innovative assistive mobility devices, specialising in ultra soft Crutch Grips. Flexivity designs, develops and manufactures handle covers for crutches, rollators and walkers. We work with experienced physiotherapists, product designers and our customers to develop and deliver superior products at an affordable price. Healthcare professionals and customers around Europe invariably associate Flexivity with premium quality and superior comfort. Do you suffer from painful hands when using a mobility aid? If yes, then you need Flexivity, the most effective and comfortable solution for hand pain associated with mobility aids. Flexivity grips are specifically designed for mobility aids and have a shock absorbing gel interior that helps to prevent the development of painful blisters, calluses and pressure sores on your hand and reduces the transfer of injury causing impact to your wrist, elbow and shoulder. Flexivity grips are made from the highest quality durable lightweight materials that provide maximum user comfort and stability. Flexivity grips are ergonomically designed with your safety and comfort in mind and the positioning of the cushion and straps ensure that you can maintain a firm hold on your device at all times. Flexivity grips are very easy to install on your mobility device, with Velcro® straps that can be adjusted to accommodate different size handles. Flexivity Grips will not detach from your device while in use, giving you the confidence to go about your daily life. Flexivity Mobility Grips can be hand washed at 30° C.
Which Flexivity product is right for me? SudoGrip Crutch Grip - Small - An ultra thin handle cover measuring 10cm in length and suitable for all standard child crutches. Flexivity Crutch Grip - Standard - An ultra thin handle cover measuring 11cm in length and suitable for all standard crutches. To ensure that you select the correct size Grip for your crutch, please refer to our Crutch Grip Sizing Guide. Flexivity Multifunction Grip - An ultra thin handle cover measuring 11cm in length and suitable for standard crutch, rollator and quad stick handles. Flexivity Waliking Frame Grip - Standard - An ultra thin handle cover measuring 11cm in length and suitable for standard walking frame handles. All orders dispatched within 24 hours, with free standard shipping on UK orders. Don’t suffer in silence any longer, order your Flexivity™ Grips today.